Behind The Thrills | Erik’s Advent Calendar-9 Days til Christmas! Erik’s Advent Calendar-9 Days til Christmas! Erik’s Advent Calendar-9 Days til Christmas! It’s the most wonderful time of the year, and it’s coming fast! A favorite of mine as a kid was the Advent Calendar. For those who are unfamiliar with the concept, Advent Calendars counted down the days until Christmas with fun little calendars. Usually hidden behind the numbers of the calendar were little toys or candy. Little gifts to have fun with before Christmas Day. With that in mind I present to you my calendar full of Christmas Joy. Every day we will knock another down the peg and share a bit of Christmas joy either in the form of a film, a theme park celebration or a special event or show. We will showcase something new and fun every day until Christmas! So get ready to unwrap and share some holiday cheer! 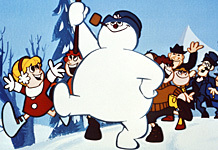 What is now a staple in Christmas specials started life out as a simple song. Hot off the success of another Christmas song, Gene Autrey and the Country Cass recorded the song in 1950. It became an instant hit and spawned an animated short. The film was such a huge success that it spawned a Rankin-Bass book, and a longer animated special starring Jimmy Durante. Christmas Memories: Merry Christmas from the staff at Behind the Thrills! Erik’s Advent Calendar-T’was the Night Before! Erik’s Advent Calendar-2 Days til Christmas!